I was able to fulfill a life long dream of providing forever homes to heritage/ rare breed chickens (Australorp, Chantecler, Delaware, Dominique, Favorelle), Angora goats and rare breed sheep with the late 1990’s purchase of 10 acres in central NJ (Bethlehem Township, south of Hampton, near Spruce Run Recreation Area). Sales of eggs, feathers, fiber and fiber products allow me to provide my animals with plenty of room to roam, good vet care when needed and thus long, happy lives. 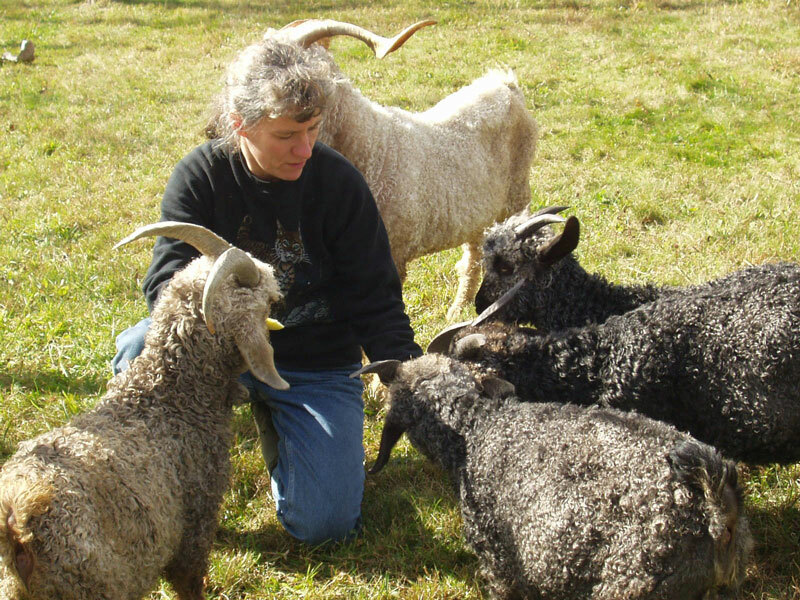 As of February 2017, my oldest animal is a 15 year old Shetland sheep (TyDye)! I’m also continuing the heritage of the small family farm which has become endangered in the USA. Everything produced is born, grown, and processed in the USA at this farm or by other small USA family farmers/ mills. The small farmer has their animal’s best interests at heart since their success depends on their animals. Compare to the activities of large international corporations with a focus on cost reduction and maximum profit at the expense of animals they do not directly touch. An animal is a living being and should always be treated with respect and handled responsibly no matter how difficult the situation. Decisions made from afar make it much easier to disregard the animal’s quality of life. Here at Dancing Waters Farm (DWF) I produce “farm fresh fiber”. You will “know your fiber” as fiber products include the name of the animal(s) that produced it as well as the type of fiber – you won’t get that from a commercial store! My products are all one of a kind. To learn more about natural fibers please take a look at my “Fiber Facts” brochure. Most commercial yarn is made of plastic (acrylic, etc.) which is why it’s relatively cheap. Creating fiber products is also incredibly labor intensive which is why yarn is primarily spun in under developed countries to reduce costs. I’m just wondering if you could possibly tell me about the lovely copper tapestry loom in your blog. Perhaps where I could obtain one. I live in New Zealand. The land of sheep and cows. Bethlhem Township NJ, just south of Hampton, just north of Spruce Run Recreation Area.